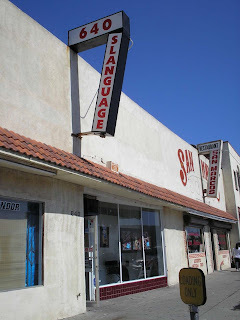 Slanguage Studio is an artist-run space and art collective founded in 2002, operating from a storefront in the industrial/harbor neighborhood of Los Angeles in Wilmington, California. Originally intended to be a studio for poet/artists, Karla Diaz and artist Mario Ybarra Jr., Slanguage Studio became an art project and public space in response to a need for art by the community. Slanguage Studio is dedicated to art, education, art workshops, performances, music, residencies, and curating of events and exhibitions all over the world. The work of Slanguage artists operates as examinations of conflated and excluded social norms, often examining complete environments, identity, neighborhoods, invisible histories and marginalized cultural, street narratives. Slanguage’s most recent projects include “Police and Thieves” at Chicago Hyde Park Art Center (2011), “Landscapes” for MDE 2011 in Medellin, Colombia (2011) “Defiant Chronicles: Women and Graff” at MOLAA (2011) CA, “Possible Worlds” at LACMA (2010-11), “Slanguage” (2009) at ICA Boston; and Engagement Party MOCA Los Angeles (2009). In accordance to Slanguage’s mission of arts education and mentorship, for the Bailout Project, we’d like to propose that you fund a project for SLANGAIR (Artist in Residency). This is part of Slanguage’s art residency program which annually invites local artists from Los Angeles, from California, including one from Los Angeles, a national artist, and an international artist to make a new piece of work. As part of this residency we have a literacy component that invites poets/organizers/activists to do events that will promote literacy at the studio/community. We have a green residency program that invites artists to also work with the community but also with our Teen Art Council. During their time at Slanguage, each artist builds a body of work to show at the studio’s gallery space and may include teaching a workshop, leading a lecture or panel discussion. Please visit one of our latest project “Slanguage TV” working with El Paso Texas and Ciudad Juarez to make the first bi-national project since the most recent violent attacks in Mexico. 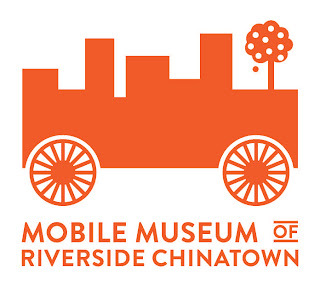 Part activist architecture, part education station, with a hint of playfulness, the Mobile Museum of Riverside Chinatown is a transportable kiosk that will engage the public about the history of Riverside’s Chinatown and the current political struggle to preserve the historic site. The project aims to share untold stories and document an important piece of Asian American history, and larger US history. In Riverside, one of the most well preserved archaeology sites containing invaluable artifacts documenting one of the oldest Chinatowns in the country is under attack. Private development is attempting to purchase the site, and the community is organizing. Partnering with Save Our Chinatown Committee, a 501(c)3 non-profit organization, we plan to construct a mobile museum that will serve multiple functions. The Mobile Museum will display photographs of artifacts that are in storage at the Riverside Metropolitan Museum, hidden from public view. Additionally, it will be a roving information booth that will provide important information about the political campaign to save the site to the community and serve as a mobile volunteer station. It will also be an interactive art workshop station for the community to create their own vision for a public park on the site, NOT a medical building. The Mobile Museum will be deployed in Los Angeles, Riverside and other locations, to support interactive learning, political awareness, and cultural exchange. It’s portable nature is a comment on the ability to reclaim space for our history, not confined to a brick and mortar structure. We CAN build our own cultural institutions! 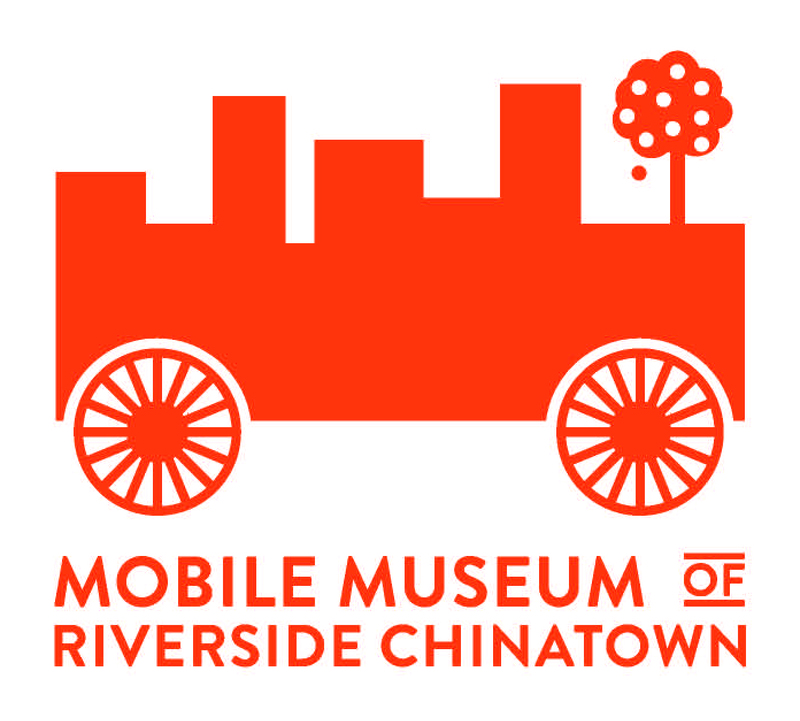 Think silkscreened canopy, collapsable modular architecture, community art, and political message—that is the Mobile Museum of Riverside Chinatown. This will be a collaboration between DreamLA (Melissa Guerrero) and FrameShiftDesign (Theresa Hwang), both LA based art and design studios. Actual Size Los Angeles is collaboratively run by Lee Foley, Justin John Greene, Samia Mirza and Corrie Siegel. The current Actual Size location at 741 New High Street in Chinatown, Los Angeles opened in April 2010. Actual Size has hosted over 20 exhibitions/ curatorial interventions and worked with over 90 artists. Actual Size collaborates with established and emerging artists to encourage situations that activate the exhibition and engage the public. 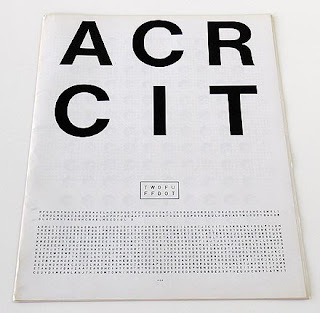 Projects curated by Actual Size have been profiled in the L.A Times, Mousse Magazine, and Flash Art International. Take a book, and you will find it offering, opening itself. It is the openness of this book that I find so moving. A book is not shut in by its contours, is not walled up as in a fortress. It asks for nothing better than to exist outside itself, or to let you exist in it. Print Imprint is a satellite exhibition in partnership with Once Emerging Now Emerging, Cirrus Gallery’s year-long exhibition project in conjunction with Pacific Standard Time. Print Imprint seeks to develop an intimate relationship and conversation between artworks from the 1970’s and 80’s, and current artworks works produced by emerging and mid-career Los Angeles artists. Participating Artists include Ali Bailey, Scott Benzel, Gui de Cointet and Larry Bell, Cayetano Ferrer, Katie Herzog, Laura Owens, Ed Ruscha, and Barbara T. Smith. The artists’ responses to the concept and form of the book will take many physical forms, including prints, paintings, slide projections, musical composition, and custom vitrines and pedestals. Actual Size will produce a limited edition book in conjunction with the exhibition. Outpost for Contemporary art has a six-year history of promoting community-based projects with international influence. Through Outpost's residency program, artists from Mexico, Canada, Eastern Europe and South America have operated for extended residency periods from Outpost's Highland Park headquarters and embarked on projects that have engaged the community in a part of the city historically underserved by the region's major cultural institutions. Outpost also serves as an important satellite for members of Los Angeles' vibrant artist community whose practices manifest largely outside the realms of galleries and institutions. Outpost for Contemporary Art seeks to engage and enrich diverse Los Angeles communities through cross-cultural exchanges and interdisciplinary projects that blur the boundaries between art, social practice, and public life. Programs support the work of innovative, socially-engaged artists who utilize public spaces, temporary venues, and collaborative methods of production to foster intimate contact and genuine connection with their audiences. Outpost has been connecting people to art and artists through a wide variety of events, exchange programs and residencies since 2004. 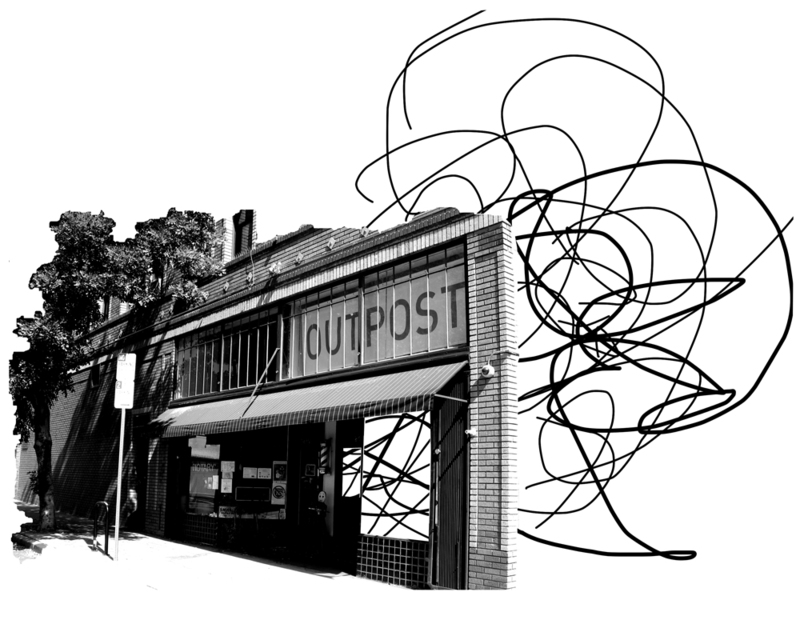 Alive to the specificity of its location in heterogeneous Northeast Los Angeles, Outpost’s programming actively creates community and intellectual exchange on local and global levels. 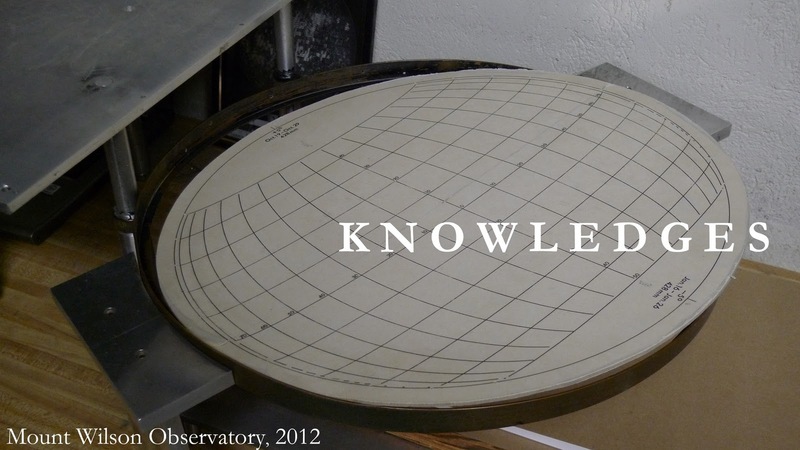 Knowledges is an emerging, artist run curatorial organization that seeks to broaden the context of contemporary art production and reception. Our mission is to create dialogue between contemporary art and geographic sites of historic, scientific or cultural influence by organizing site-specific explorations and events. Our first major project is an event that will take place at the Mount Wilson Observatory. Located in the San Gabriel Mountains, just outside Pasadena, Mount Wilson is an astronomical observatory and site of historic scientific discovery, contemporary research, and sweeping views above Los Angeles. Art and science communities thrive in Los Angeles, but seldom have occasion to converge. We are initiating a dialog by inviting contemporary Los Angeles artists to create and exhibit works in response to the location, history and influence of Mount Wilson. This weekend-long, experimental event, scheduled for June 2012, will incorporate exhibitions, performances, film/video screenings, and other forms of temporary installations on the observatory grounds, as well as night viewing through the telescope. The observatory has granted us unprecedented access to the facilities and grounds, including the historic auditorium, astronomical museum and the observation decks inside the 60-inch and 100-inch telescope domes. Funding from an Artist Bailout grant will help cover our project’s organizational costs, including the development of a comprehensive research website, the creation of a companion publication, printed event maps or promotional materials, and a possible park permit fee. Additionally, we need to raise funds to rent the 60” telescope. 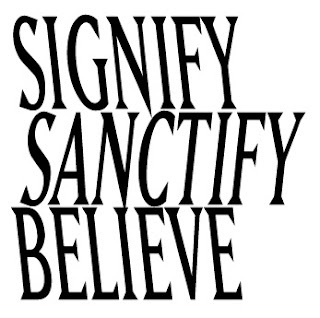 Signify, Sanctify, Believe—facilitated by Claire Cronin, Adam Overton, and Tanya Rubbak, and featuring the sacred gifts of dozens of contemporary artists, performers, and visionaries—is invested in the temporary, playful exploration of [semi-]fictional religious technologies. This year we hope to travel our two very special branches – The Saints and Servants of the Order of [Con]Temporary Religious Observance, and The Library of Sacred Technologies – up, down, and around the West Coast and Southwest, spreading the good word and creative gospel currently infusing the sanctified work of our Los Angeles experimental art and performance community. In addition, we hope to meet and collaborate with artists in these locales as well, as we continue to produce creative, gentle, temporary religious services, sermons, healing dens, and so forth. Money earned through the Artist Bailout will potentially help us visit Portland, San Francisco, Albuquerque, Santa Fe, and Salt Lake City. It will also help us print and distribute more copies of our Library of Sacred Technologies. 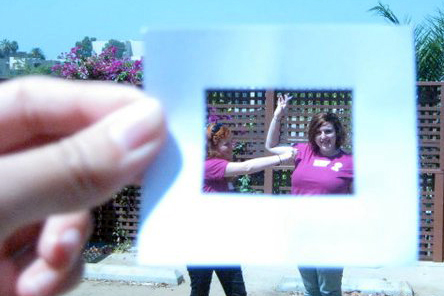 This past summer, I founded the Mobile Pinhole Project, a new community arts organization in Los Angeles. The Mobile Pinhole Project brings hands-on photography workshops to youth in neighborhoods across Los Angeles using the VanCam, a giant pinhole camera on wheels. The Mobile Pinhole Project is having a huge impact for kids across Los Angeles, guiding them to re-examine their neighborhood community through a visual lens. The “oohs” and “ahhs” from the kids when they go INSIDE the camera makes all the hard work worth it. Unfortunately, we can’t continue our programming unless we raise funds to support our materials and maintenance costs. The Artist Bailout micro-grant would support the paper, developing, snacks and gas for 5 workshops, allowing us to continue to inspire the creative leaders of tomorrow by making arts education available to youth who otherwise don’t have access to creative outlets. In half-day mobile workshops guided by professional local artists, young people experience photography as a powerful tool for exploring their communities. Our workshops makes visual arts geographically and technologically accessible by allowing youth in neighborhoods across Los Angeles inside the mechanism of photography, empowering a collective visual exploration of identity, culture, and place. Funding for arts and education has been cut deeply across the United States, and California is no exception. Twenty-nine percent of California's public schools offer no study in any arts discipline. Los Angeles has lost 25% of its full-time elementary art teachers in the past three years. Yet, we know that artistic expression is fundamental to youth development – as a tool for self-expression, communication, and critical thinking. Personally, founding the Mobile Pinhole Project has been a personal milestone for me, furthering my goal to improve accessibility to arts education for all youth.